Have you entered my #canitforward giveaway? Decorating with subway art is a quick way to add some fun and color to your seasonal decorating. I started using subway art almost 2 years ago. All it costs is my time, paper, and the cost of ink. My kids love helping me pick out new subway art before each season starts. I have 4 black frames I use for displaying subway art. Depending on how I stage my mantel, I use one to two pieces of subway art on there first before displaying the other subway art in my dining room and office. I use a black frame from Joann Fabrics to keep the look uniform. Right now, Joann Fabrics entire stock of frames is on sale for 50% off. Add in Free Shipping w/ $50 purchase. Code DCFY235, and you’re all set for your fall subway art decorating project. This weekend I decided to try my hand at creating my own fall subway art using PicMonkey. I use PicMonkey all the time to create images for my site and social media, using tips from my friend Clare of The Super Mommy Club. 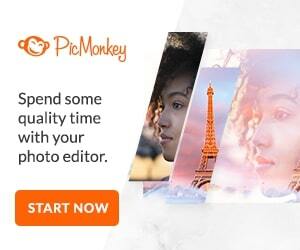 PicMonkey is a breeze to use when resizing images for different platforms. You don’t need to be a design pro to use its editing and design options! Free Printable Back to School Routines at The Super Mommy Club. Click on each image to download the jpg file. The jpg file will NOT have my logo on it. All the files are stored on my shop site. Then, open and print in your favorite photo editing program. I use Adobe Photoshop Elements to print mine. Because the jpg is already sized for 8 x 10, you won’t need to change the size when printing. Follow Barb Hoyer: A Life in Balance’s board Subway Art on Pinterest. Great words. They totally make me think of Autumn. This weather has been so crisp lately! It’s interesting to feel the cold air in the morning during August. Thank you! Yes, I’m feeling the pull of fall with this awesome August weather. These are really cute, I should print some for my house I would love to do a different one seasonally on my mantle. Fall is such a lovely time of year! Awesome printables Barb!! Can’t wait to decorate my new mantle with some this fall! These are so cute! Thanks for sharing at the Bloggers Brag Pinterest Party.